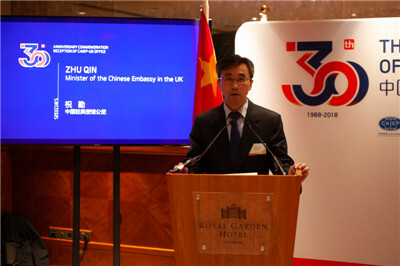 On November 29, Minister Zhu Qin attended and addressed the reception marking the 30th anniversary of the UK Office of the China Association for International Exchange of Personnel (CAIEP) and the launch ceremony of the UK as the Guest Country of Honor at the 17th Conference on International Exchange of Professionals. 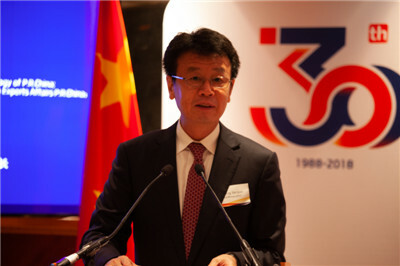 About 120 representatives from Chinese and British governments, universities, research and training institutes, and startups were present, including Zhang Jianguo, Vice Minister of the Ministry of Science and Technology of China and Administrator of the State Administration of Foreign Experts Affair (SAFEA), the Rt Hon. Lord David Willetts, former Minister of State for University and Science, the Rt Hon. Lord Sushanta Kumar Bhattacharyya FRS, Chairman of the Warwick Manufacturing Group and Winner of China Friendship Award, Sir Peter Bonfield OBE FREng, Vice-chancellor and President of Westminster University and Deputy President of the Institution of Engineering and Technology. Vice Minister Zhang pointed out that the Chinese government attaches great importance to the international exchanges and cooperation in the field of science, technology and personnel. It will carry out more active, open and effective talent policy to provide more convenience and quality service to foreign experts working in China. He hoped that British experts would be able to come and stay in China, make full use of their expertise, and choose where they like to work so as to contribute more to China-UK friendship. Minister Zhu said in his speech that China-UK cooperation in the field of science and technology has delivered “golden fruits” for the China-UK “Golden Era”. The world is undergoing deep and profound changes unseen in a century, and China-UK cooperation on innovation faces unprecedented opportunities. “China has a large population and is tapping its rich human resources to train more experts and the best-minds. The UK is a well-developed centre of learning and has numerous advanced research institutions”, Zhu said. There is a broad prospect for talent exchanges in all fields at all levels between China and the UK. He expressed the hope that people from various sectors in China and the UK would seize the opportunities and forge ahead to make China-UK cooperation on science, technology and innovation the primary productive forces, major driving force and the most important resources for China-UK relations, so as to make greater contribution to China-UK “golden Era”. Afterwards, Vice Minister Zhang, Minister Zhu, Lord Willetts, Lord Bhattacharyya and Sir Bonfield jointly cut the ribbon for the UK as the guest country of honor of the 17th Conference on International Exchange of Professionals. 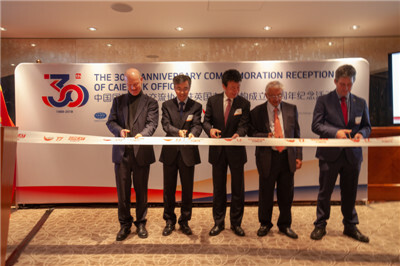 The China Association for International Exchange of Personnel (CAIEP) UK Office was founded in 1988. Over the past 30 years, adhering to the concept of mutual benefit and win-win results, the CAIEP has been carrying out in-depth exchanges with British experts and people from various fields, and briefing them on China’s talent policy and cooperation opportunities. As a bridge of China-UK personnel exchange and cooperation, the CAIEP has been playing an active role in promoting China-UK science and technology exchanges and cooperation and China-UK friendship. The Conference on International Exchange of Professionals (CIEP), first convened in 2001, is China's largest, highest-level and most influential international and comprehensive talent exchange meeting. It is also a platform for exchange and cooperation on talents, technology, projects and management. The 17th CIEP will be held from April 14 to 15, 2019 in Shenzhen with Britain as the only guest country of honor.